Another weekend, another wilderness adventure. 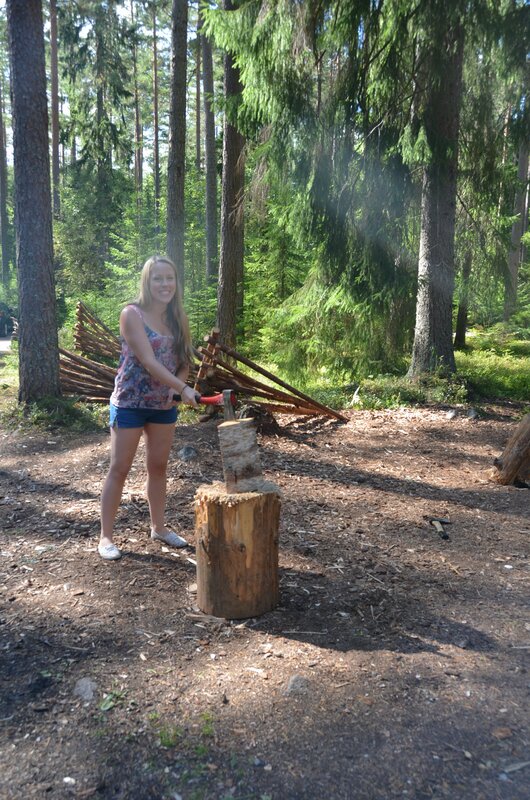 We were back in Sweden but this time, I was joined by my friend Serena from Geneva and we had chosen this particular adventure for its headlining act: tracking wolves. We’re about to launch an online training business called Wolf Leaders Academy and it felt like the perfect activity both to celebrate the launch and to actually learn more about the behaviour of wolves, on which we had based our concept of leadership. So it was that we flew to Stockholm, rented a nice little Volvo, and drove 2.5 hours west to spend the weekend with a group of strangers in the middle of the forest. Looks like someone was hungry! Serena examining the beaver lodge on the other side of the lake. 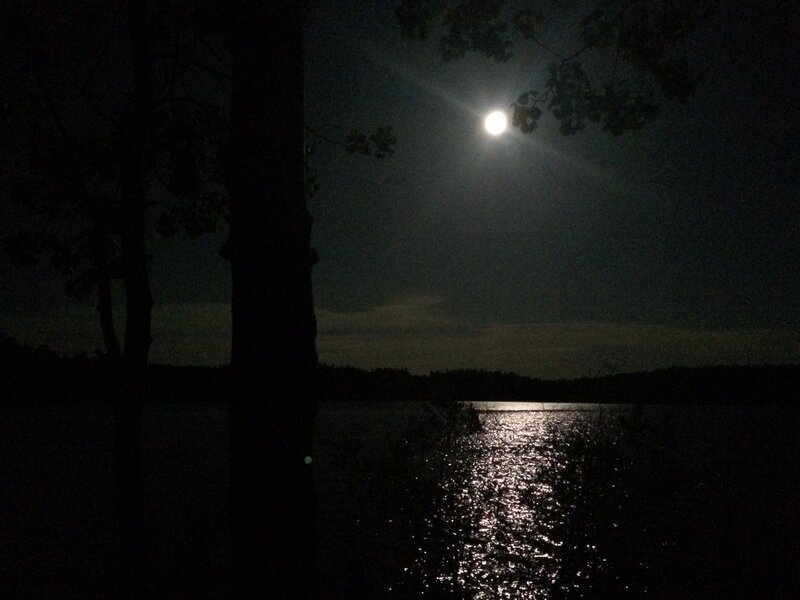 We spent several hours travelling silently across the lake (the boats had electric engines) as the sun set behind the trees and an almost-full moon rose up to take its place. Eventually we were rewarded with several sightings of beavers swimming alongside our boats, crawling out onto land and even a couple playing together. 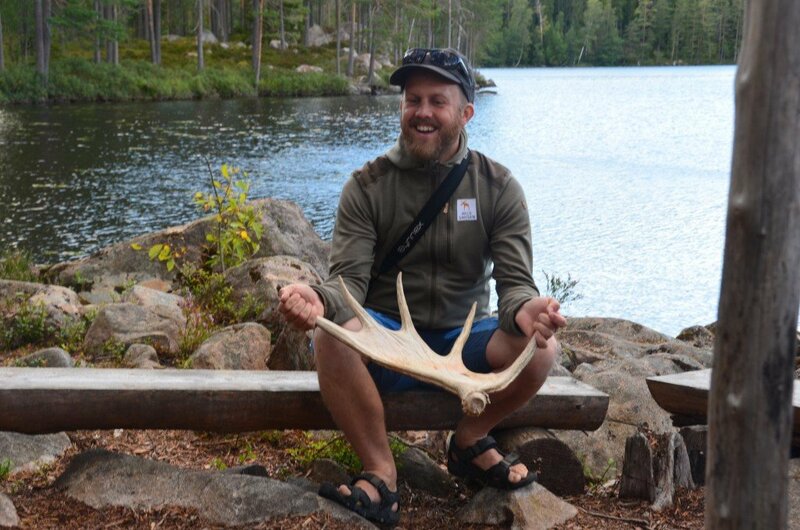 On the second night, we turned our attention to a slightly larger animal, the moose (or is it an elk?). 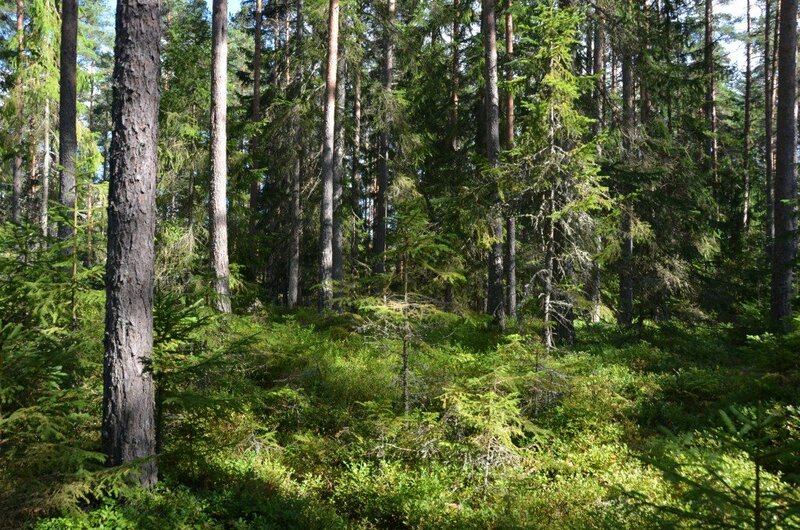 We hiked through the forest as quietly as we could – which, as it turns out, was not very quietly at all, with twigs snapping under our feet and branches scratching across our Gore-Tex jackets. In fact it’s very difficult to spot moose and other wild animals during the day and we started to have better luck as the sun was setting. Markus, our guide, had a clever technique, which was to shine a bright searchlight into the edge of the forest, the eyes of the moose reflecting back the light making them easy to spot. We saw several moose bulls, a cow and a calf, a couple of hares, roe deer and possibly even a lynx. A real Swedish forest, full of trolls and pixies and, probably, Mumins too. 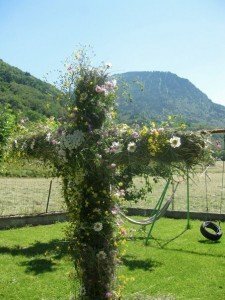 It was completely eye opening for me and, at times, hilarious to see this whole experience through the eyes of an Italian. While I was warm, poor Serena was shivering and getting allergic reactions to the mosquitos. For a Swede, who’s spent all her summers in this mild climate, this is as good as it gets: sunshine and a water temperature as high as 20 degrees. For an Italian, used to the Mediterranean heat and a clear blue ocean, I now see that this is not such a typical experience! 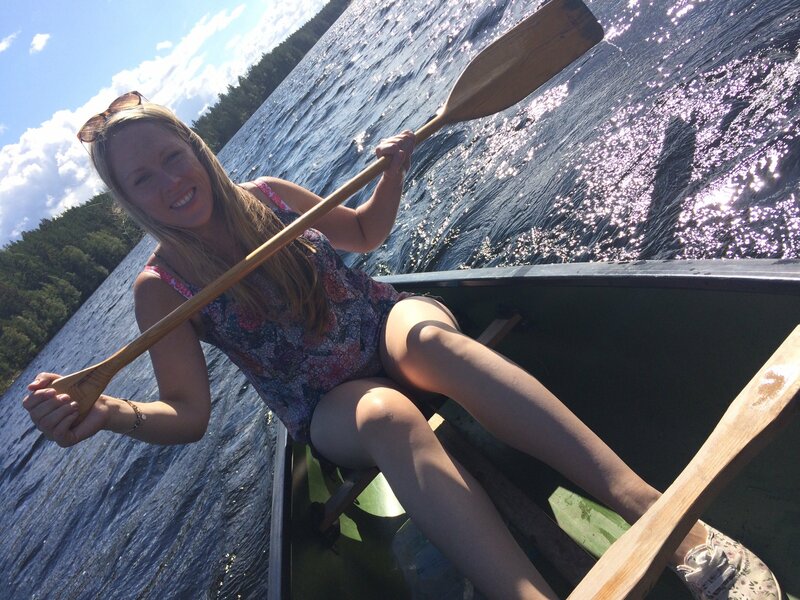 On the third and final day, we took the canoes out onto the lake for a bit of a paddle. Serena and I soon realised that getting back to the starting point would be tough with a strong wind and current working against us so we started back almost as soon as we had reached the other end of the lake; at one point I swear we were just standing still, despite our best efforts at propelling the boat forward! 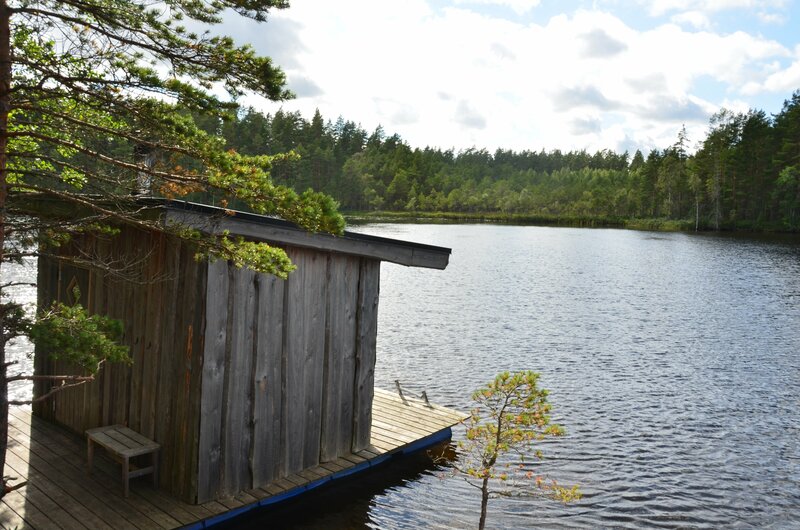 When we finally returned and got the canoe back on land, we rewarded ourselves with a couple of rounds of relaxing in the floating sauna alternated with, at least in my case, some swimming in the lake. Secret Adventures: The whole trip was organised by Madoc of Secret Adventures, who also ran the Arctic trip, the kayaking under Tower Bridge, and the secret island adventure. 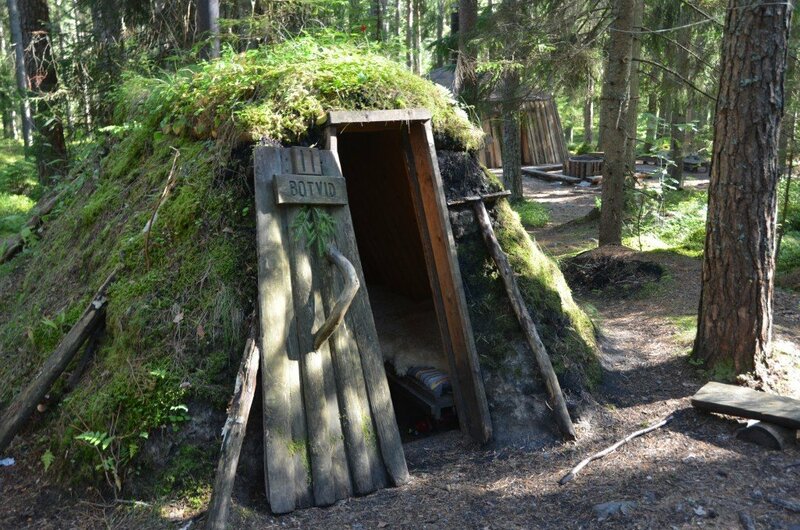 Kolarbyn Eco-lodge: “Sweden’s most primitive hotel” offers packages together that include wildlife safaris with Wild Sweden (see below – the two companies were originally one). They also offer romantic stays with cute little picnic baskets and bottles of wine if you want a bit more luxury. 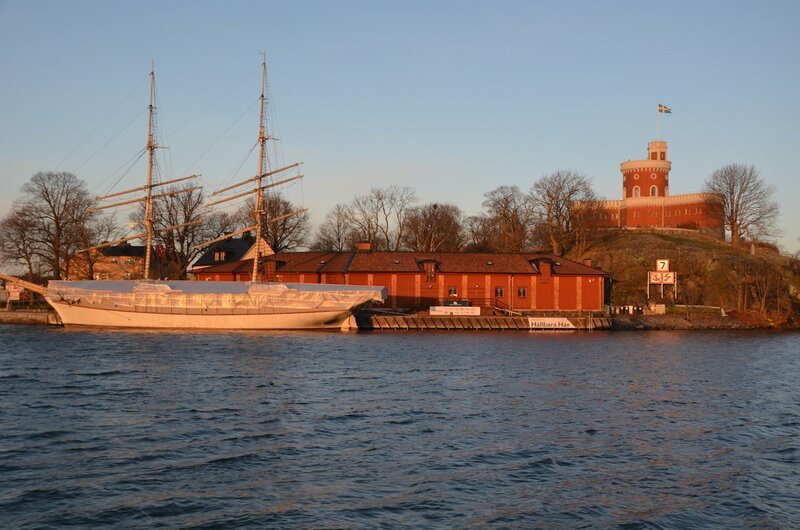 Best of all, you can fly to Västerås which, let’s face it, is basically Westeros from Game of Thrones. 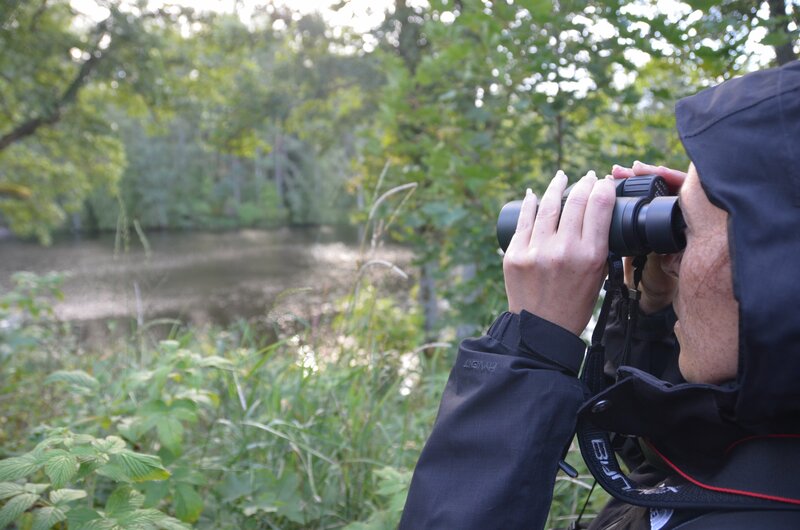 Wild Sweden: If you’re interested in exploring the wildlife of Sweden on one of these Nordic safaris, you can choose from beavers, moose and wolves as well as bears and wolverines, and other different types of activities. 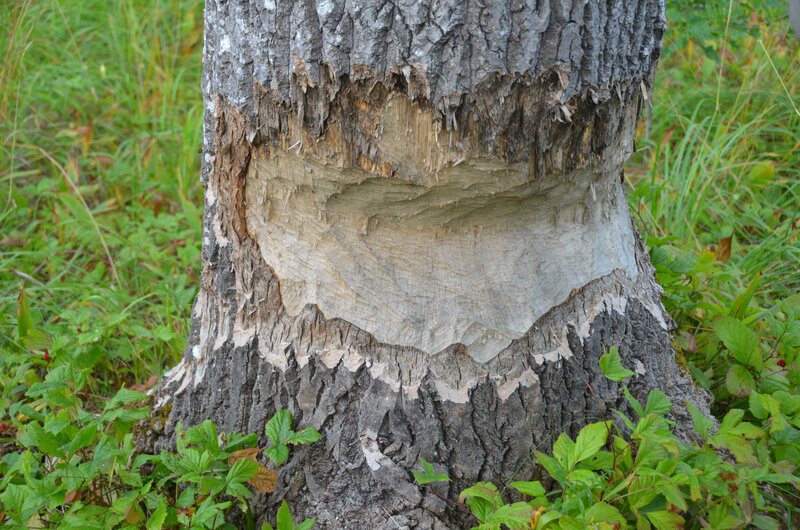 Make sure you spend a few days here, though, as they can’t guarantee a sighting on one evening so it’s a shame if you’re putting all your eggs in one beaver lodge. It was the stillness that took me most by surprise. 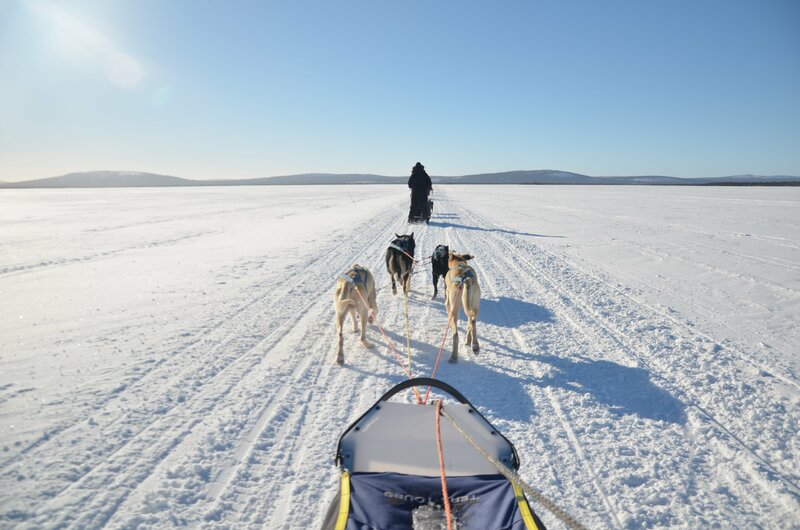 The only sounds were the panting of the dogs and the pitter-patter of their paws on the ground, the crunch of the snow against the runners of the sled. A blanket of granulated sugar lay around us, broken up here and there by the evergreen trees. Branches bent over our path under the weight of the snow, creating a portal through which we entered another world; then the landscape would open up and we would be crossing a vast frozen lake. When we arrived at camp, the wilderness cabin where we would be staying for two nights, I was stunned to find out that we’d been going for more than three hours. We had flown into Kiruna, Sweden’s northernmost town, earlier that afternoon. After a hot lunch and a quick briefing, we were kitted out in our Arctic gear and given a little scrap of paper with the names of our dogs. 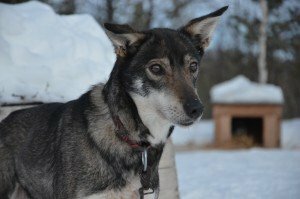 I was given Miki and the oldest and loveliest of the dogs Tofa in the front, and in the back I had Toby and Balto; before I knew it I was standing on my individual sled with four impatient huskies pulling eagerly at the reins. I lifted my foot off the brake… and we were off! Now, I’m really not a dog person, and I must admit that this was the part of the trip that I had thought the least about (except to imagine sitting down in something more like Santa’s sleigh) – but after this first afternoon of sledding through the frozen landscape of Narnia, I mean Kiruna, I would have happily ended the trip there with no regrets. 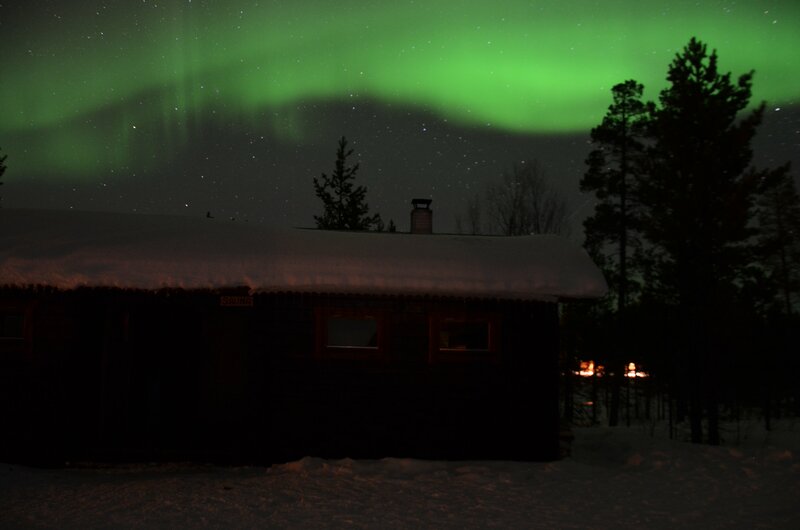 That night, we fed the huskies and then ourselves, rewarding ourselves further with some relaxation in the sauna hut. We alternated the roasting inside with sprints out into the snow to cool down, hesitant at first but getting more and more daring with each go, eventually frolicking freely in the snow before heading in to get warmed up. When we were once again fully dressed, we headed back out into the snow for what we had all been secretly hoping for: a chance to see the northern lights. There are trips that focus only on this, chasing the aurora borealis with experts who will all but guarantee a sighting; for us, though, this would be a bonus, on top of an adventure that had already more than delivered. It’s impossible to capture the majesty of this phenomenon but a photo gives you a little taster of what we witnessed that night. The skis were old school military skis, a couple of pieces of wood basically with some straps. How are you supposed to ski on these long thin slippery things?! 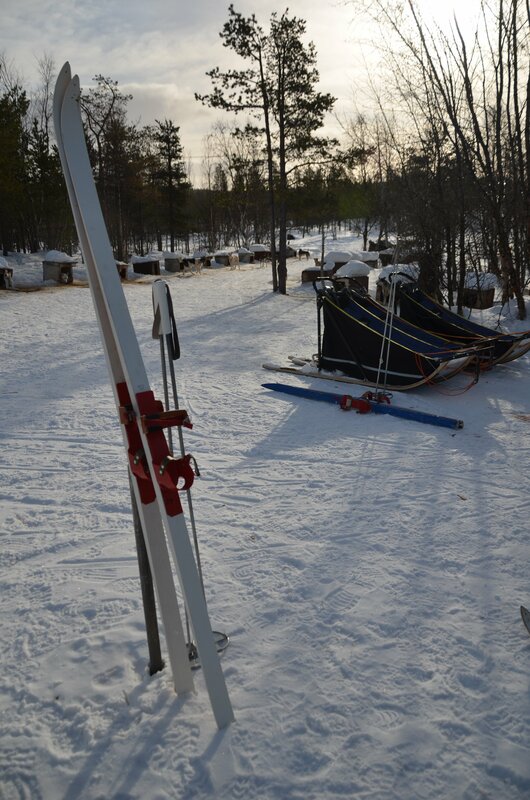 On the second day, the dogs got a break as we went for a cross-country ski. Now I may be Nordic but I do not have a whole lot of experience of Nordic skiing, having only been once, many years ago. Things were made more difficult by the fact that the snow kept freezing on the underside of my skis, providing some welcome traction on the uphill bits but being less helpful when I was trying to actually ski on the downhill stretches. 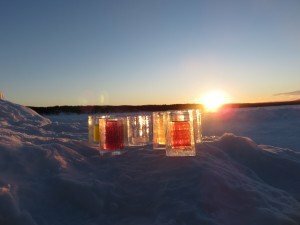 Once I had managed to knock all that ice off with some very aggressive kicking and stomping, it was smooth sailing. Well, not quite… After we’d finally made it to the top of a big hill it turned out that downhill was even trickier. We fell like dominos, laughing with increasing hysteria as we went. How are you supposed to ski on these long thin slippery things?! 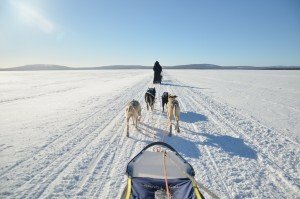 By the end of the day, some of us having also chosen to do the longer route, we were losing control of our poor fatigued limbs, and having run out of water early on we were eagerly munching on snow just like the huskies. On finally arriving back at the cabin we had a much-deserved sauna and some more arctic rolls; after an also-much-deserved shot of vodka to revive the spirits! The next morning, we had our second and last day of dog sledding. This time, we were responsible for gathering and harnessing our own dogs, and I think we were all feeling a whole lot more comfortable knowing more what to expect. In fact, when we were nearing the end and travelling through a narrow and windy bit that had thrown a lot of people off their sledges on that first day, this time we glided through like pros. I love how a group of amateurs can get to a sufficient level of skill to enjoy something as random as dog sledding within just a couple of days, or even hours, of picking up those reins. The wilderness weekend was organised by Madoc of Secret Adventures. If you’re tempted, and how could you not be, there will be a new Arctic adventure 21st-24th January 2016. This one is in the middle of winter and likely to give you a more authentic Arctic experience than our blue-skies-and-warm-sun experience in March! 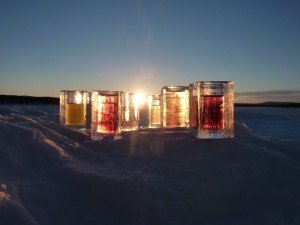 You’ll fly to Kiruna via Stockholm with either Norwegian Airlines or SAS and the rest is all organised by Madoc and the team. With Saturday’s voting result, Sweden cemented their status as Eurovision legends with a sixth win, second now only to Ireland with their seven wins. So for such a small country, Swedish music packs a punch. If the Eurovision wins weren’t enough, we’ve also produced Ace of Base, Avicii, Swedish House Mafia (duh! ), the Hives, the Cardigans, Europe, Roxette, Basshunter, Robyn, and, I’m sure, many more. Come on people, admit it: part of the attraction of Måns Zelmerlöw is that he is, as we would say, a snygging. I read some time ago that Sweden had the best looking men in the world; I’m afraid I can’t find the source of that scientific study right now but based on physical evidence I’m inclined to believe it’s true. The girls aren’t too bad either (okay, I may be biased) and in fact every man I’ve ever told that I was Swedish has always replied, “I dated a Swedish girl once,” proceeding to butcher the three words of Swedish they’ve managed to remember. Not that it’s necessary to learn the language, as ve all speek Eenglish verry vell. It’s not just the people who are beautiful but the scenery as well, from the mountains in the north to the open fields of the south. Allemansrätten, the public right of access, means that you can roam freely more or less anywhere, picking berries and wild flowers and even setting up camp for 24 hours without the land owner’s permission. 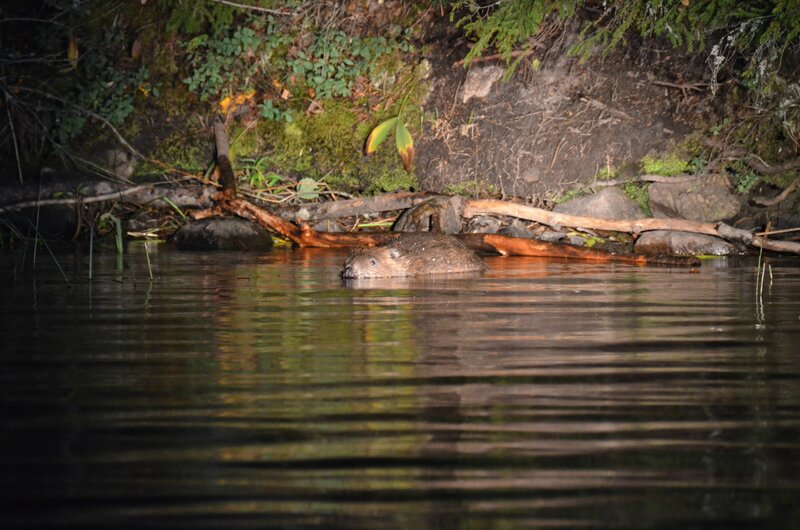 And why not try some wild swimming – although bear in mind that the water never gets particularly warm so you’ll need quite some courage to dive in. 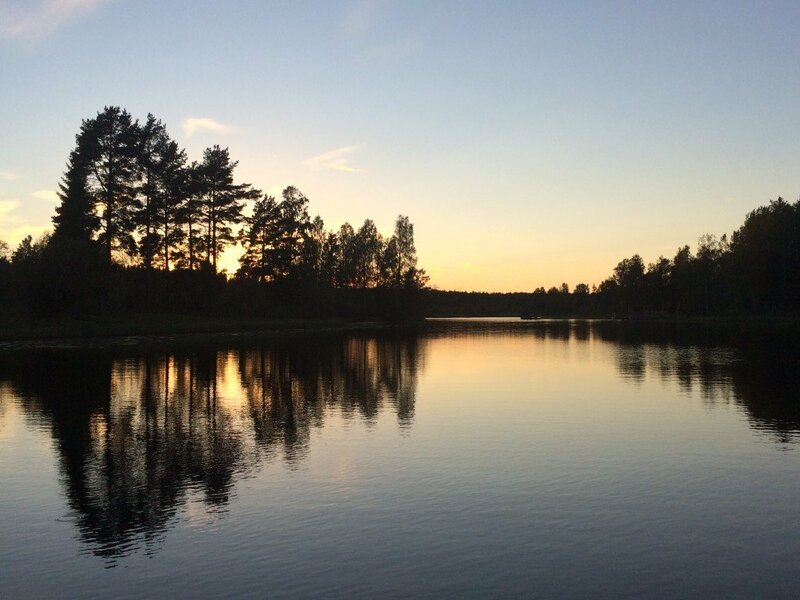 Most people also have a country home that they can escape to over the weekends and the summer holidays, so try to get yourself invited over to enjoy the fresh air and mosquito bites that the Swedish countryside has to offer. 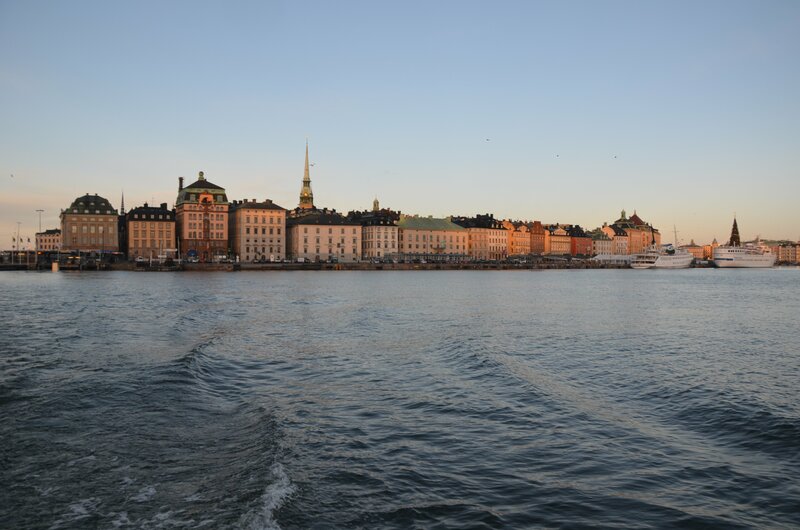 It’s hard to choose a favourite part of Sweden but having spent most of my time in the capital of Stockholm my choice has to be its archipelago, which contains the largest number of islands in the world. Take a ferry out to Utö for the day, or sail out into the skärgård and cast anchor in some quiet bay. 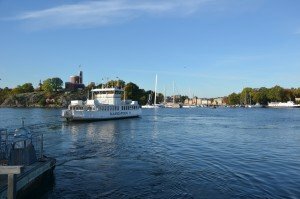 If you don’t have a lot of time then at least go across to Djurgården where you can visit outdoor museum Skansen or take your children to Astrid Lindgren’s story world of Junibacken. You can also rent a pedalo or go on a sightseeing cruise to explore the city from the water. 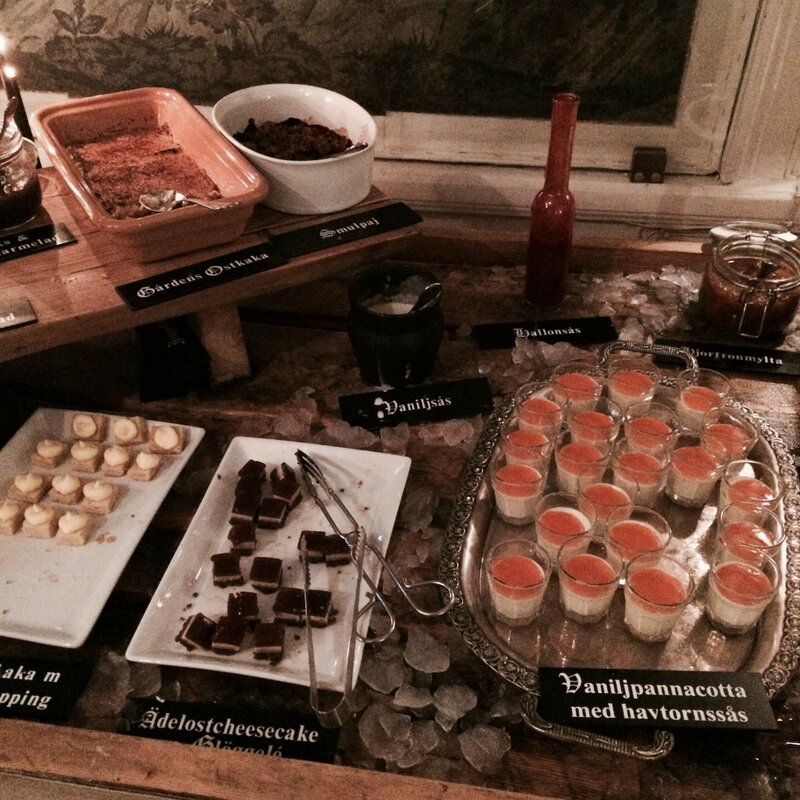 If you haven’t heard of fika, hello, where have you been?! 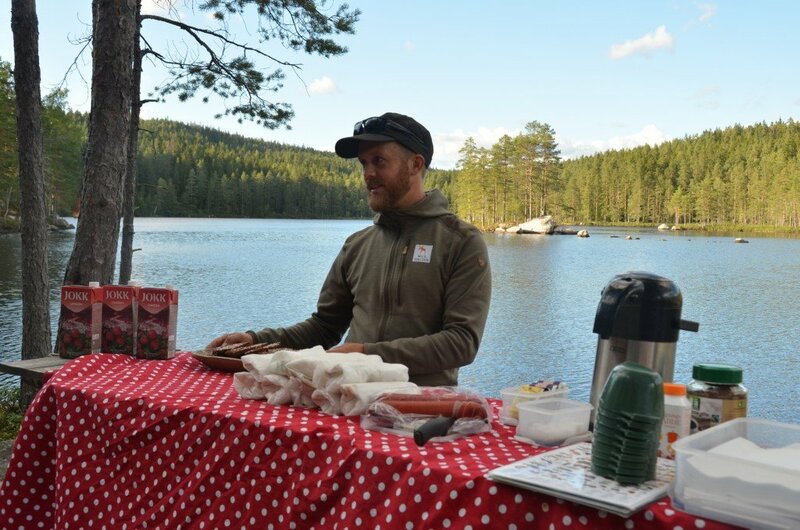 It is the coolest aspect of Swedish culture, something like a coffee break but really so much more. Swedes are among the biggest coffee drinkers in the world and we will meet morning or afternoon to guzzle the stuff as we munch on anything from a banana to a cinnamon bun or a chocolate ball. The cinnamon bun deserves a special mention here as it’s so important that it even has its own day, 4th October (incidentally the day after my birthday, how fitting). 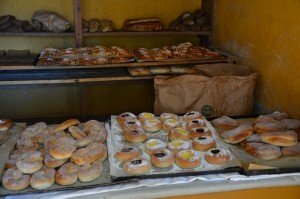 It has a cousin, the semla, which is eaten as of Shrove Tuesday as a sort of equivalent of pancake day, and another, the lussekatt made with saffron that we eat for Saint Lucia on 13th December with gingerbread to commemorate the eye gouging and death of this Italian saint (don’t question it, just enjoy). Stereotypical food from Sweden is what you’d expect: meatballs, gravlax, prinsesstårta (green marzipan cake made famous most recently by the Great British Bakeoff) – everything you’re used to seeing at IKEA. It’s impossible not to also mention surströmming, fermented sour herring that has such an overpowering smell that you’re forbidden from opening it in apartment blocks. 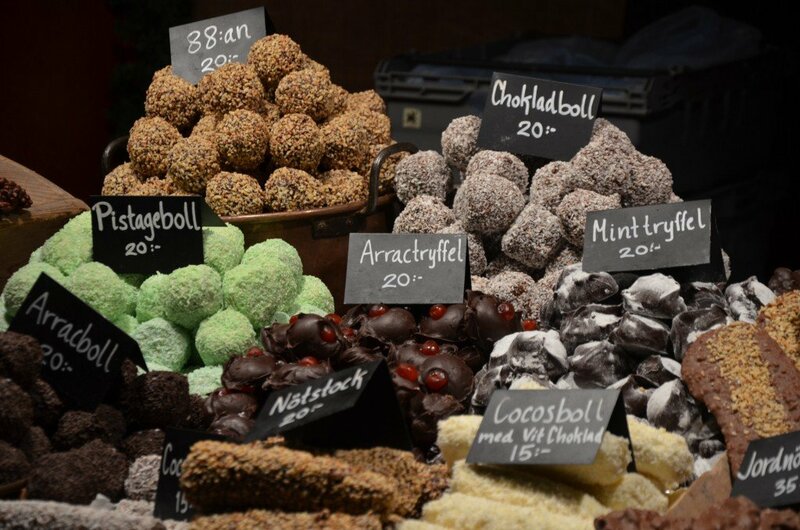 A sweeter treat is lördagsgodis, a tradition of eating chocolate and sweets on Saturdays. 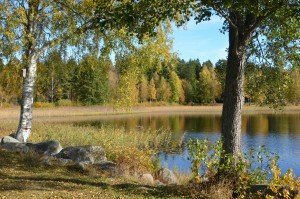 There’s also a much more refined side to Swedish cuisine, with delicious fresh fish and seafood, game, and vegetables. My latest discovery is Ekstedt, a Michelin-starred restaurant where they cook everything on an open fire – they even featured recently in Masterchef, so they must be good. Whatever your taste in literature, you’ll probably have some reason to visit the landscapes that inspired your favourite book. The most internationally famous include children’s author Astrid Lindgren and her many creations such as super-strong Pippi Longstocking as well as the Moomins from Finnish author Tove Jansson (she wrote the books in Swedish); Stieg Larsson’s Millennium trilogy and his Girl with the Dragon Tattoo; and, most recently, the 100-year old man who climbed out a window (in an old people’s home in the town where my grandparents had their country house) and disappeared. We’ve had seven winners of the Nobel Prize in literature. In TV, we’ve also surfed on the wave of popular Scandinavian crime series with Wallander, based in the small town of Ystad in the south. 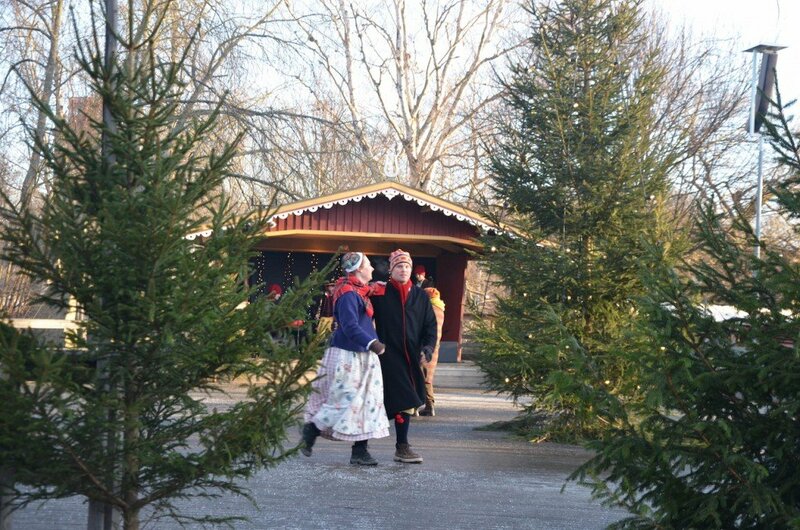 Now, let’s face it, I think you should go to Skansen at any time of year. It’s worth visiting even if there isn’t anything else going on, just to walk around the old buildings and the zoo. At Christmas, though, it’s extra special: all the houses and farmsteads come to life with traditions from years gone by, the strains of Christmas songs fill the air, and the Christmas market comes to the main square with all sorts of goodies to eat and drink. 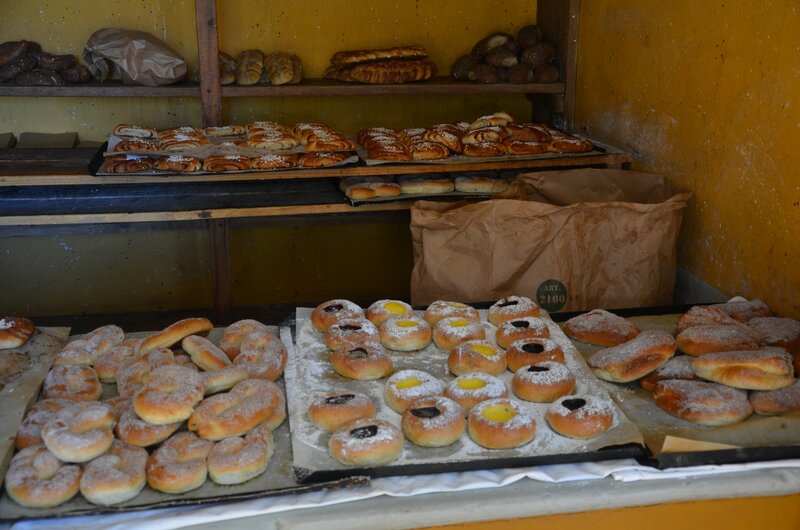 Join in with the folk dancing, ride in a horse-drawn carriage, eat some reindeer meat with cloudberry jam, and don’t forget to buy a bulle from the bakery. 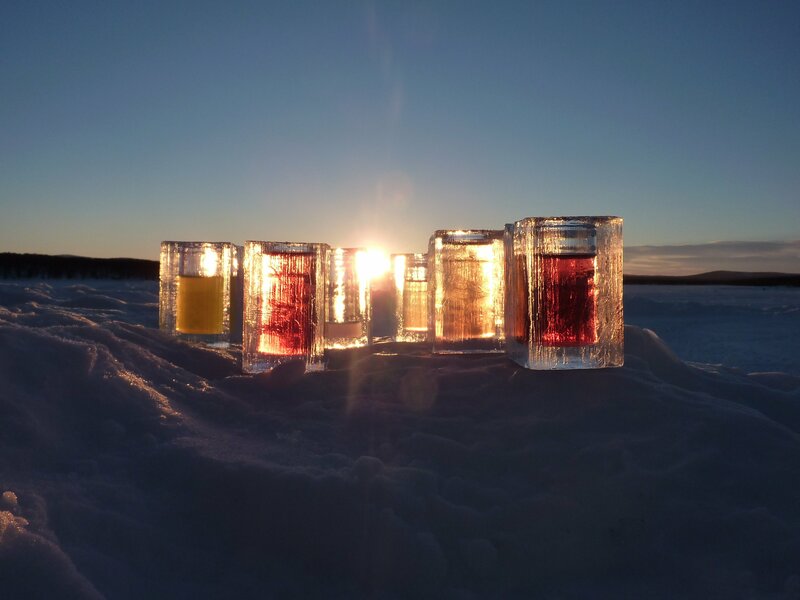 The sun doesn’t make it very high in the sky during the winter, but this makes for some beautiful light effects. 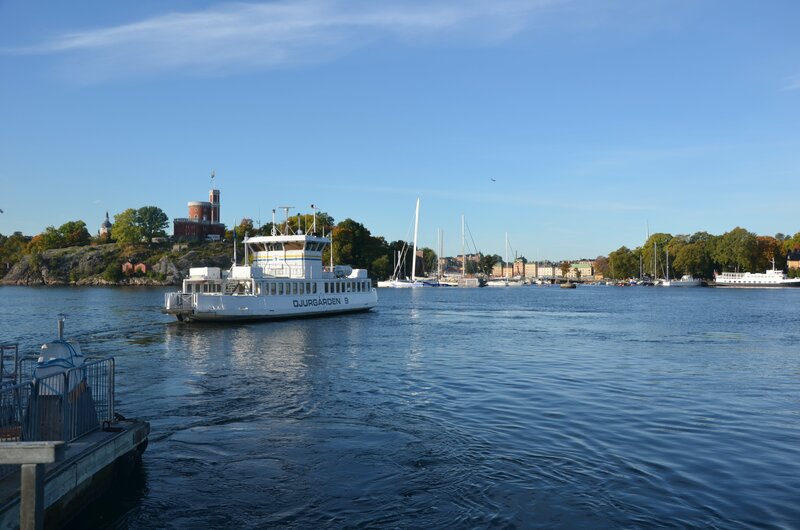 This is Kastellholmen, on the way over to Djurgården. 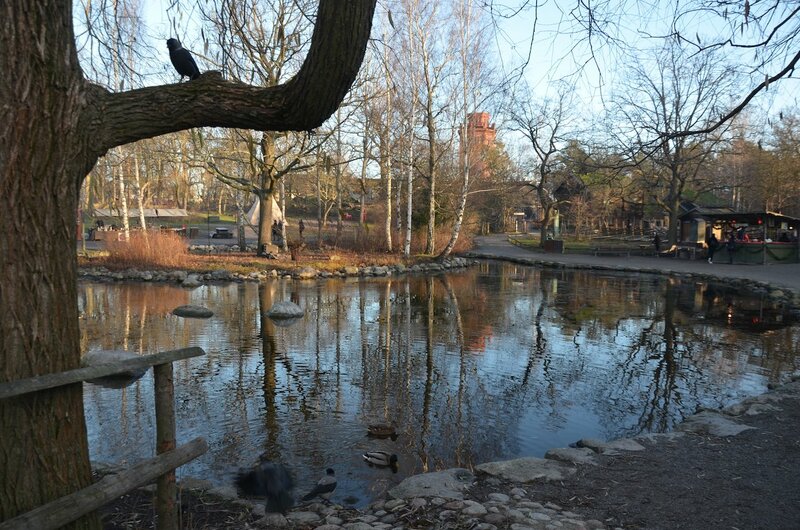 Skansen is beautiful in different ways at different times of year. Stunning during autumn when the reds and ambers adorn the trees, the barren branches of the bleak midwinter also bring a certain beauty. A couple in folk costume dance around the main stage. Later on, the stage filled with people as they joined in with the traditional songs and dancing around the Christmas tree in the middle of the stage. The stalls are full of food as well as different arts and crafts. 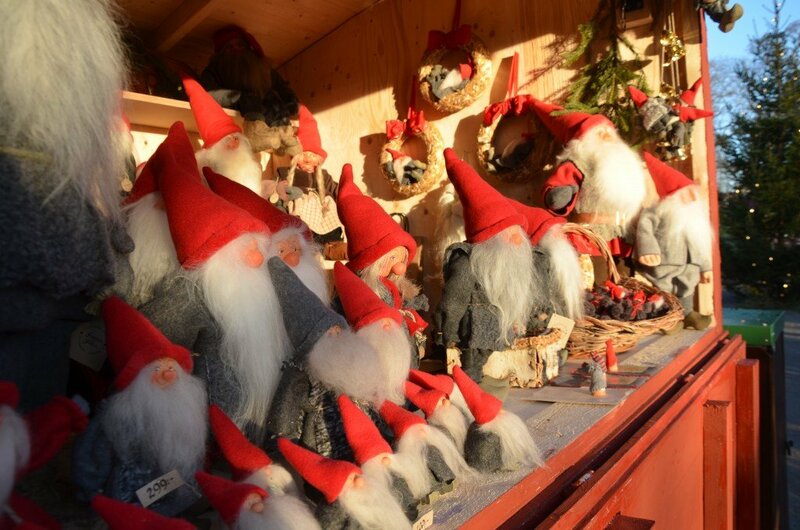 These tomtar, or tomtenissar, were originally thought of as ancestral spirits although this idea has been lost over the years and now the Tomte has more or less become Santa Claus. 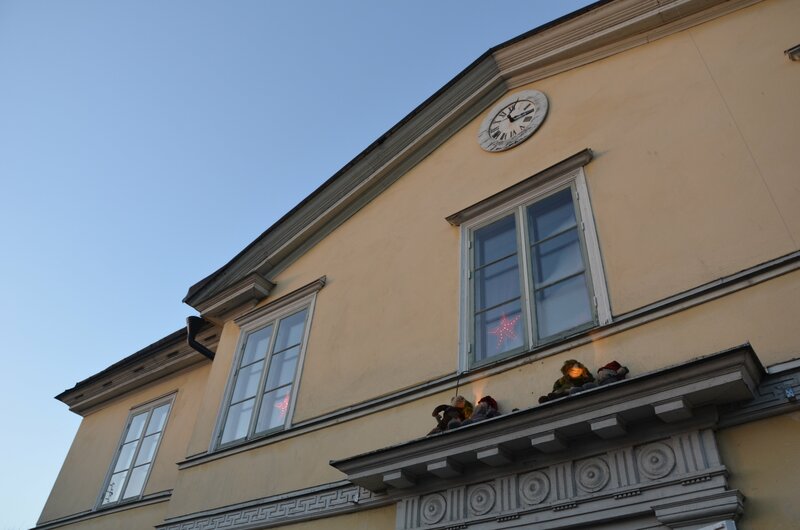 Almost every restaurant and hotel in Sweden will have a julbord, the Christmas version of the famous smörgåsbord, during the month of December. It’s a more extensive and ambitious version of what we then eat at home on Christmas Eve: herring, cold cuts, Christmas ham with apple sauce, meatballs, sausages, cheese, rice pudding, and lots of lovely little desserts and chocolates to finish off. Try Grand Hôtel, Operakällaren or, our choice for the last few years, Carlshälls Gård (website only in Swedish). For all the gory details, see last year’s post on this seven-course feast. 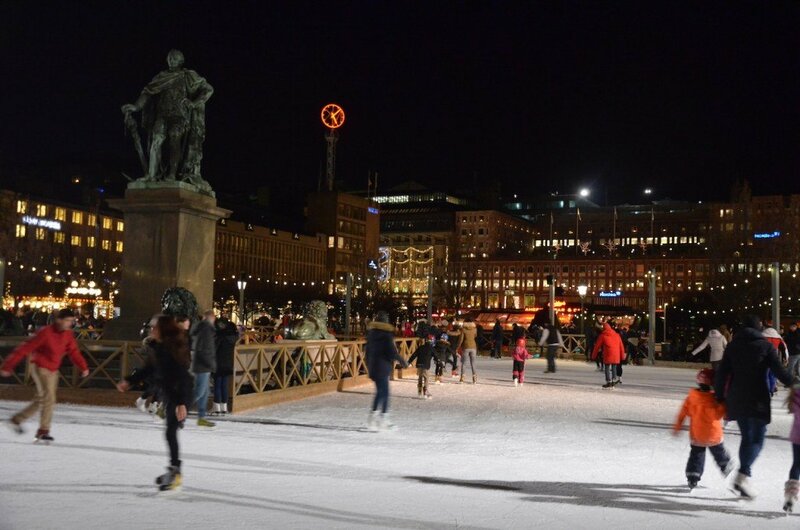 The ice rink at Kungsträdgården has been in its current location since 1962, and the tradition of skating in the area goes back to at least 1854. You can rent skates or bring your own and skate for free. For an extra dose of Christmas spirit, you can go to another Christmas market right beside the ice rink once you’ve had enough of toe loops, Lutzes and axels (or shuffling along while holding on to your skating partner for dear life, as the case may be). Show off your skills on the ice at Kungsträdgården. As this is Sweden and we are oh-so-responsible, you’ll see that the young kids are wearing helmets and dressed top to toe in ski gear. For gaining back your energy after all that strenuous skating activity: not just chocolate balls, a Swedish classic; lots of different flavoured balls! 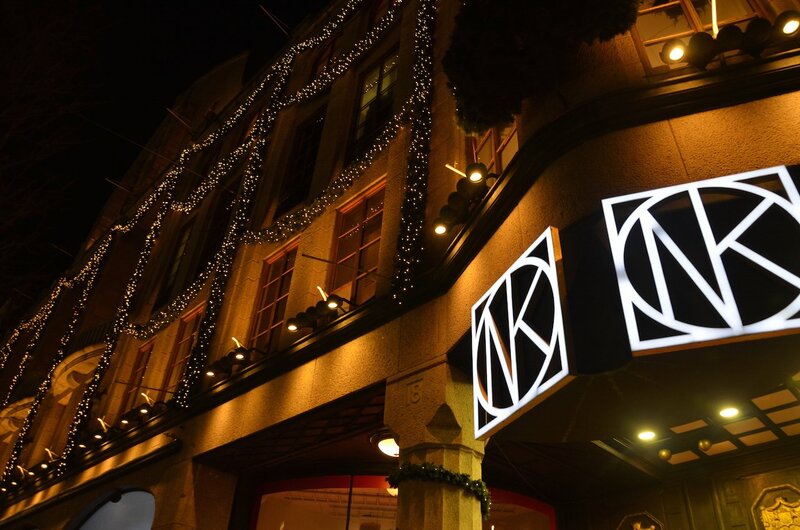 Nordiska Kompaniet first opened in 1915 and is Stockholm’s big luxury department store. Having bought all your own Christmas presents already, you can look on with a self-righteous smirk as shoppers rush around in a last-minute panic, and why not have a fika in one of the many cafés. 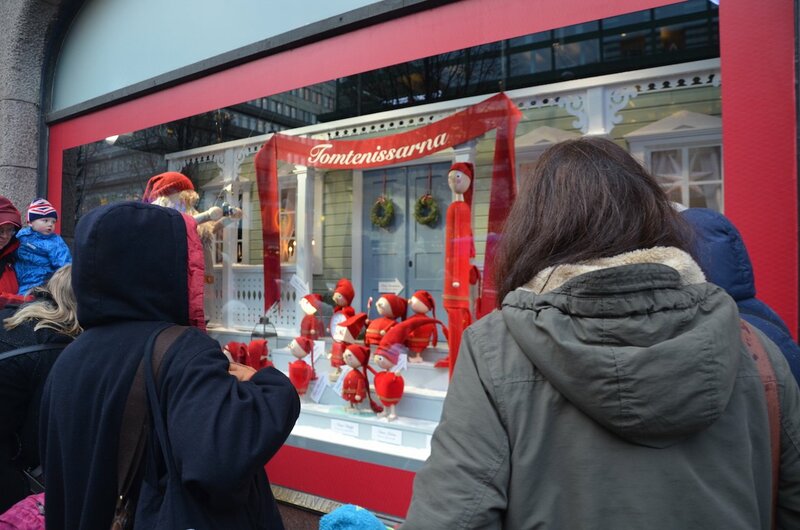 Be sure to check out the Christmas window displays, this year depicting the world of the tomtenissar and their hard work getting all our presents ready for Christmas. NK is open until 9pm these last few days before Christmas – perfect for all that last-minute present buying! 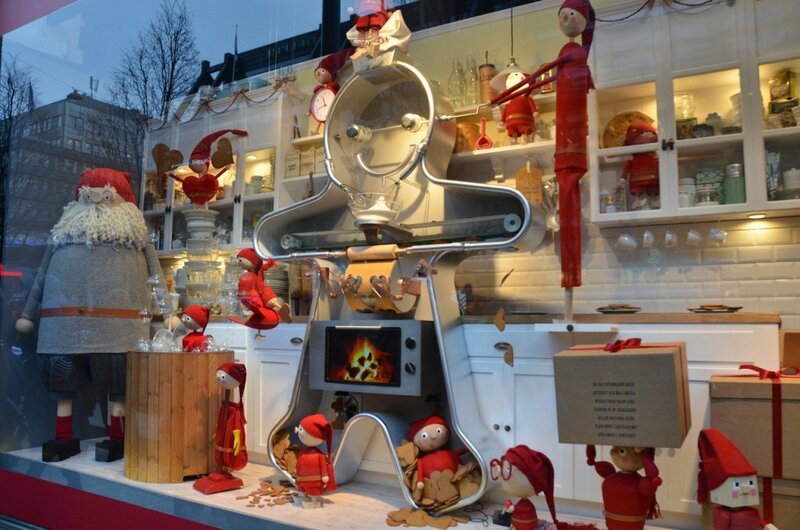 The window displays are more popular than ever this year, with crowds blocking the pavement all day long. Should your taste buds not be sophisticated enough to cope with saffron in a sweet bun, then you can opt for the classic cinnamon bun instead. 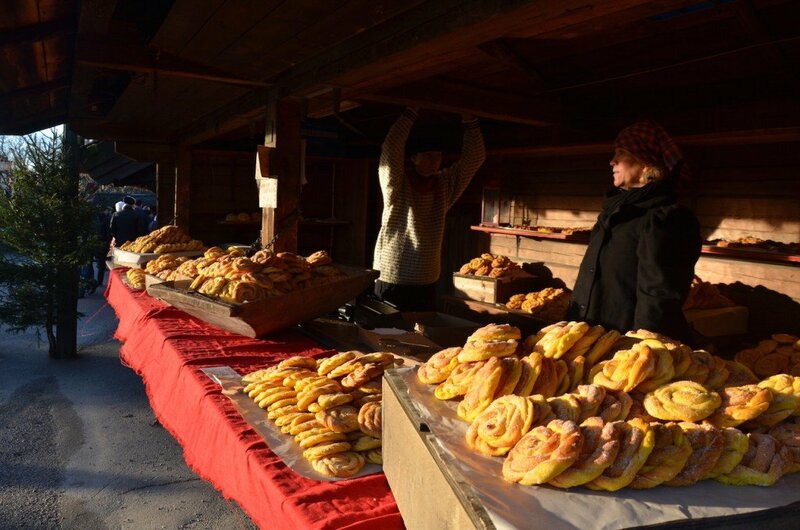 Saffransbullar basking in the sun at Skansen. And with that, I am fully Christmasified. Now I may have mentioned this before but for me the highlight of going to Skansen is actually the bakery and its cinnamon buns. 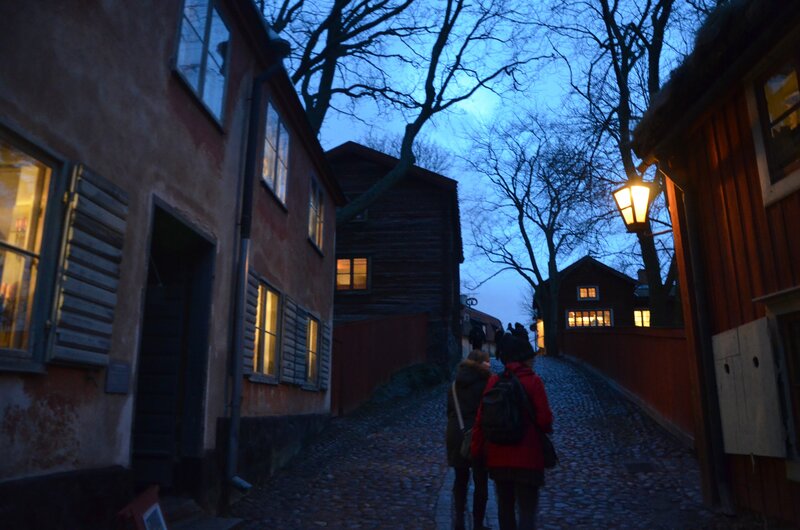 (Skansen is an open-air museum in Stockholm, where you can experience how people lived over the different centuries and in different areas of Sweden.) 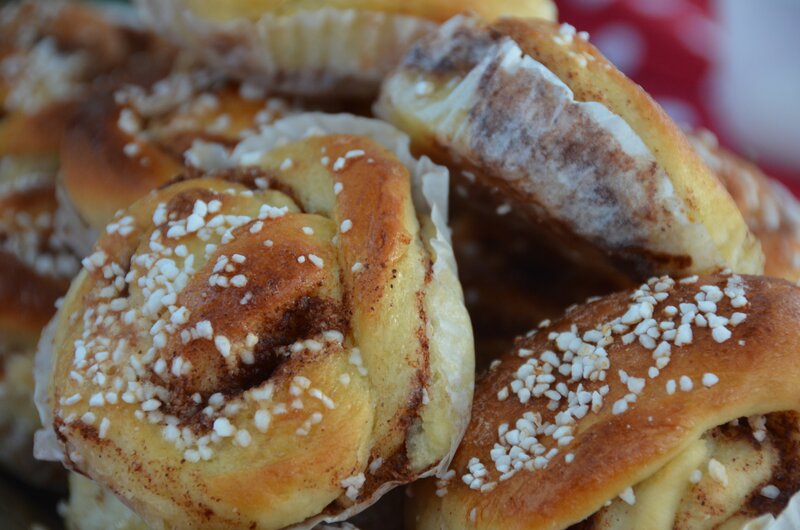 Kanelbullar are believed to have originated in Sweden (though some sources online seem to claim they come from France – quelle horreur!). We eat them all year round but these days, at least in our family, it’s mostly over the Christmas break that we actually have time to bake them. There’s something so satisfying about kneading the dough, watching it rise, breathing in the warm cinnamon smell that seeps out into the kitchen and beyond. 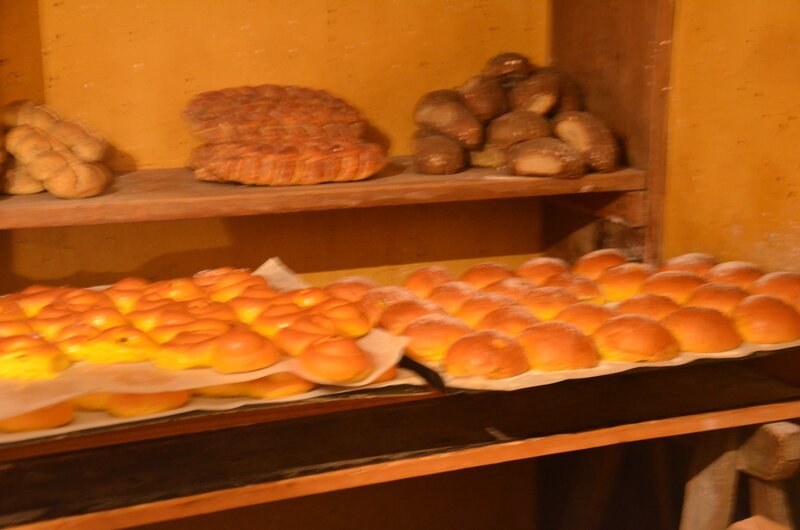 This time, however, Skansen offered more than carbohydrates. Since the Christmas market was on, they had opened up many of the houses that you usually don’t have access to. 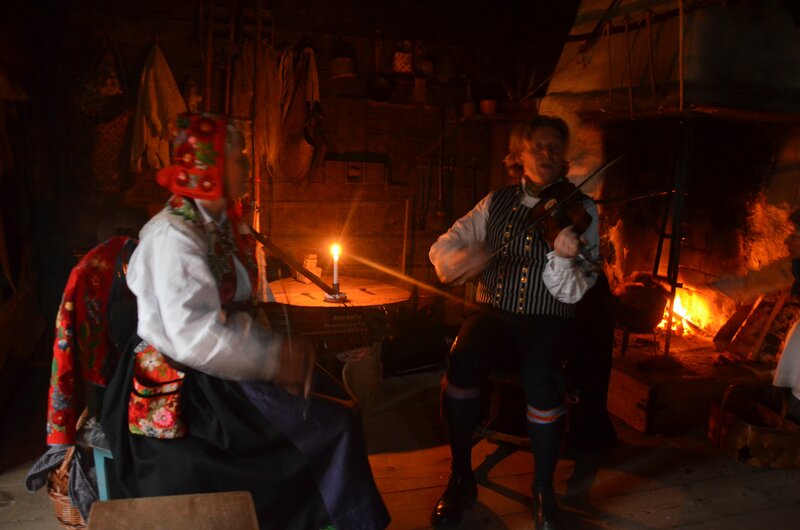 In Älvrosgården, a farmstead that looked closed from the outside but into which we anyway ventured, we found a man and a woman playing traditional music in regional costume. 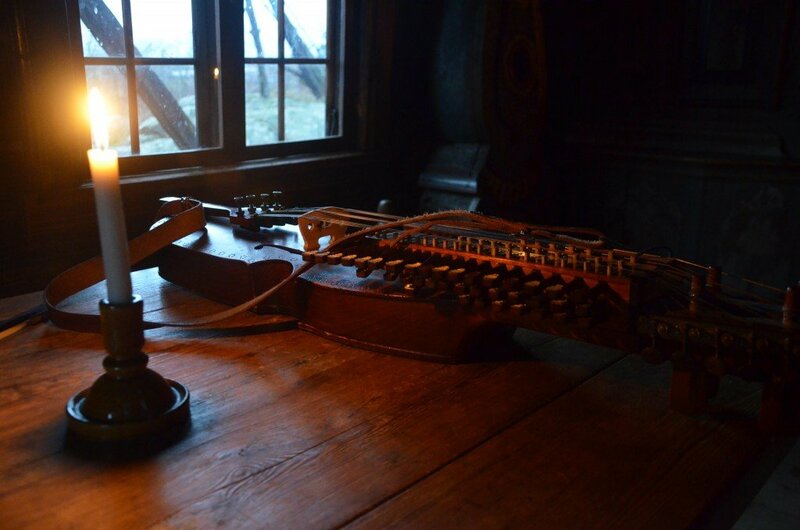 The man was playing the violin but the instrument that gave the music its special sound was the woman’s nyckelharpa. The ‘keyed fiddle’ is a Swedish string instrument that dates back to the 14th century, with keys that change the pitch of the string when pressed. In another corner, two ladies sat by the fire, carding wool. This is an old manual process to untangle and clean the wool fibres before spinning it into yarn. My sister and I got to try it when we were little, and somewhere we each have a piece of yarn as proof of our efforts. The room we were in, in fact, the whole house, was built with thick, heavy beams, the ceiling low and windows small. It was in the early afternoon but still it was dark, inside and out. It could have been depressing, making me feel sorry for my ancestors who lived without central heating or electric light; but the music, the fire, the candlelight filled me instead with a sense of nostalgia. I look around the room I’m in now and there’s a flat screen TV, a pile of Nintendo Wii games, two laptops (okay one is actually on my lap), a tangle of chargers and cables, books, papers, and, well, STUFF. In fact, yesterday morning for a few hours the internet didn’t work. Naturally I was horrified but then I felt relieved as I started working on my non-internet list of tasks (yes, there are some things you can do without needing to be connected) and then settled onto the couch to write this post. How strangely peaceful everything suddenly seemed, without the incessant vibration of my iPhone. 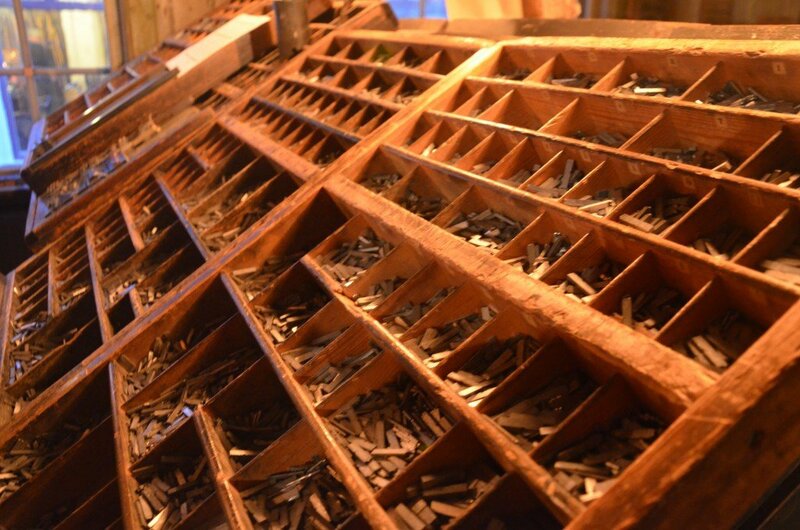 Leaving the strains of folk music behind us, we went to the printing and bookbinding workshops. My paternal grandfather worked in the printing industry, as a typesetter. 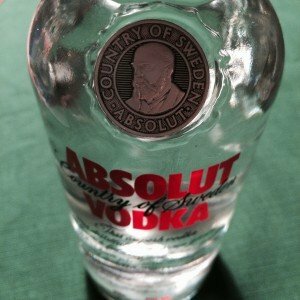 He was born in 1905, at a time when Sweden had just six years of compulsory education. When he was 12, his teacher came home to his parents and made the case for Werner to continue his schooling: he was bright, he must be allowed to continue his education. To which his father replied that this was out of the question, “Werner needs to work.” His income was needed to support the family. My granddad did have some choice in the matter, though. He decided he didn’t want to work outdoors, fearing the cold winters. He chose the printing press, working ten hours a day Monday to Friday and half-days on Saturdays. I’ve always been fascinated by Gutenberg, the man who invented the printing press and the movable type printing system in the 15th century. Here you see the wooden box used to store the letters, in their different compartments. We were shown how the letters (so small, I couldn’t read them) were arranged in the type case, with bigger compartments for the most commonly used letters: a, e, n, r, s, t. The retiree volunteer knew exactly where each letter belonged, explaining that it would have taken a new apprentice seven months to learn – a process that was helped along the way when he inevitably would knock the whole lot onto the floor, and have to sort them all back into the right compartments. My granddad had the idea of drawing up the layout on paper so that he could study it at home. He stayed at the printing press his whole working life. In the workshop, they had beautiful manuscripts that had been treasured by their owners, put proudly on display, as printing was expensive. Again my attention comes back to my bookshelves overflowing with mass-printed paperbacks and hardbacks. There are reference books that I never consult but still keep as I think they could be useful. There are self-improvement books full of wisdom on how to be more effective, get things done, be a better leader – all books that I want to re-read at some point. There are ‘coffee table’ books, which I’ve bought for myself or received as gifts. And there are reams and reams of novels, autobiographies, memoirs. My optimistic goal for this year is to read a book a week. Why is it so hard?! I love reading. And it’s not like we don’t do a lot of it, it’s just in a different form: articles, blogs, tweets, infographics… There’s a kind of false sense of productiveness, at least for me, when I spend hours on the internet reading predictions for the coming year, top ten tips, news of the latest social platform. Curling up with a book, though, feels far too indulgent, like I don’t really have time to take a break. The final stop before leaving Skansen was the tobacco museum. Our reason for going there was, I’m afraid, caffeine-related, with a saffron bun thrown in for good measure; but the tobacco museum is another place that holds special relevance for me. My grandmother, this time on my mum’s side, was one of the few women of her generation who went to university, graduating in 1945. She applied for two jobs and got both of them. The one she chose was that of a “male administrator” at Svenska Tobaksaktiebolaget, originally a government-owned monopoly, which later became Swedish Match. She too worked there until she retired. Another reminder of how different things are today, how different our expectations are. My grandmother loved mathematics and would happily crunch away at the numbers in the pensions department, day in, day out, with no thought of looking for something else. How unlike the dreaded Generation Y with their expectations of salary, promotions and showers of praise along with constant excitement as well as work-life balance. Though in fact my grandmother did have many of those things: she moved up in the ranks, received a gold watch after 40 years of service, and left the office promptly every day to arrive home in 15 minutes. And, in the end, she was happy. Not such a bad way of life after all. Just a shame it meant working for a tobacco company. Hmm.